Cultures clash and tempers flare as these two cops from different worlds quickly discover one thing in common: they can’t stand each other. With time running out, they must join forces to catch the criminals — if they don't kill each other first! I decided that I was in the mood to watch this one again. I first saw it in the theater when it originally came out and I've watched it several times since then. I've also enjoyed the sequels, though I think this one is the best. The plot is entertaining and interesting even though it isn't that complicated. Much of what happens isn't the most original, but I don't mind the predictability since things are interesting. There is a decent amount of action to what is going on, a lot of it provided by Jackie Chan and the different fights he ends up in. The fight scenes are done well and look really good. There is a good amount of humor to what is happening as well. The characters are interesting and entertaining. 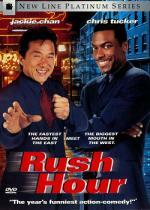 I do like Jackie Chan and Chris Tucker together, though Tucker can get a bit annoying at times. I definitely like Chan more. There are a lot of extras on the DVD. There is a long featurette on the making of the movie that is very interesting and covers all sorts of things tied to the making of the movie. It even shows Chan working out a stunt sequence. Overall, this is a well done, entertaining action comedy that is worth seeing.